Ruckus begins the new year with big ambitions and the expectation to continue the positive growth trends we showed last year. To recap 2017’s success, here are some of the achievements we posted. Our CES trade show booth for client Mobileye helped position the brand as an acquisition target just two months before it was purchased by Intel for $15.3 billion. We provided a full suite of services – branding, web design, and marketing – to support the launch of the NYC Ferry. Our major brand refresh for Simply Self Storage prompted the company to go forth with an expansion of over 500 new locations. We doubled our yearly revenue, being listed for the second time in three years on the Inc. 5000 list of the fastest-growing private companies in America. Rating and review firm Clutch named us a Global Leader in WordPress Development and a Top Branding Agency in New York City. We won two Davey Awards and two Summit Marketing Effectiveness Awards, including one at the Platinum Level. Now, as we get into the swing of 2018, quarterly ranking reports offer promising signs of continued success. 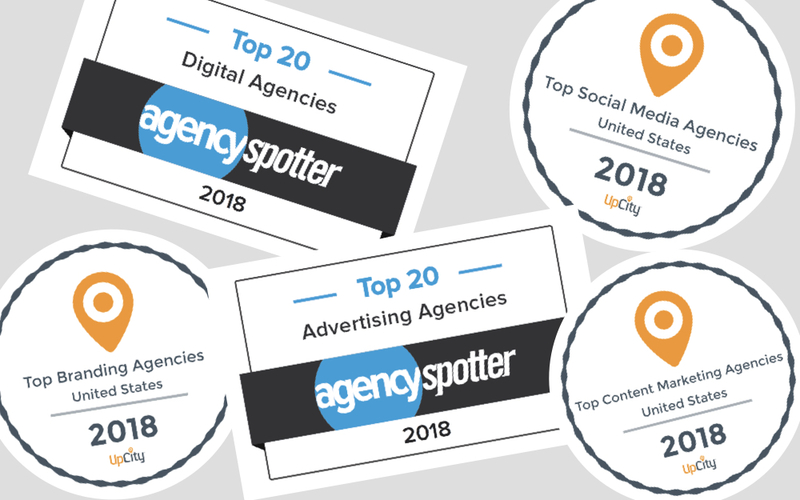 For 2018’s opening quarter, Agency Spotter labeled Ruckus both a Top-20 Digital Agency and a Top-20 Advertising Agency, selecting us from pools of 4,500 and 2,300 agencies, respectively. UpCity offered even broader praise, listing Ruckus in the top 1% of American agencies in three categories: branding, social media, and content marketing. And DesignRush recognized Ruckus as a top New York web design company. We are flattered by these rankings, and we look forward to the challenge of progressing even further in the upcoming year.